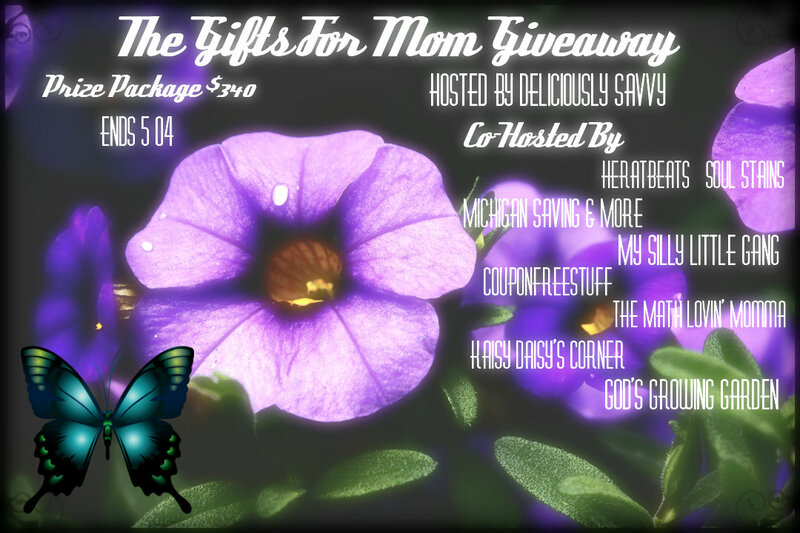 Deliciously Savvy is hosting another fabulous giveaway for all things Mom! 1 LUCKY Winner Will Receive Everything Listed Below! Check it out and enter today! A Big Thank You To All Of The Sponsors Too! Entrants must be 18 years old to enter and giveaway is open to US residents only..
Im most excited about the MIU COLOR® Packable Handy Lightweight Nylon Backpack Daypack. I don’t have anything right now that is comfortable to carry all the stuff needed for the kids. I would like to win the spiralizer. This would be great for plating when I host dinner parties. I’m most excited about the aloe vera body lotion! Thanks for the giveaway! I am most excited about the Aromatherapy diffuser. My mum has wanted one for ages, and I would love to give it to her. It would make her so happy! I would be excited to win the Emmi’s Essentials Aromatherapy Diffuser ($69.99 ARV). I have several essential oils that I would like to try in it. I am excited about the Fruit Infusion Water Bottle. This will help me stay hydrated during the hot summer months here in Arkansas. I’m most excited about the silicon mats! I am most excited about getting the fruit infusion water bottle. With summer coming this is something I’d love to have to keep me hydrated and cool. I’m most excited about the happy fingers gloves. That would be a really nice set to have since I love to cook. I would love the essential oil diffuser to put my lavender oil in at night, for a restful sleep. I am most excited for the diffuser! I have one on the main level, but would like one for upstairs as well! I think I’m most excited for the diffuser! I’m most excited about the vegetable spiraler! It looks like it’d make some fun snacks! I want to try one of the vegetable spiralizers. We had something back in my childhood days that made curly fries, and that was my jon…got an early start in the kitchen. Being a Diabetic, I am most excited about the Pedi.Cure NOW. I am constantly trying to take extra special care of my feet. So IF I win, I will keep it and use it myself. Thanks! I would have to say the Emmi’s Essentials Aromatherapy Diffuser. I have been really wanting one!! I would love to keep the Aromatherapy Diffuser for myself. The PediCure in pink would be for my mom who has pitiful little Diabetic Dryness Feet! I’m most excited about the Pedi.Cure. My feet could use it. I would really like to win the Pedi.Cure NOW in PINK. Thank you for the giveaway! I am most excited about the Emmi’s Essentials Aromatherapy Diffuser. I have been wanting one for forever! These are awesome! I’m most excited about the Perfect Sandwich Storage Container, perfect for my little brother!